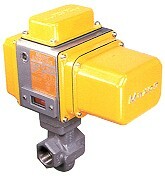 1.25" Series 5000NI with ISO threads position "TO"
Positive indication of valve body position provided through: Auxiliary SPDT signal switches mounted inside valve top enclosure. Proof-of-open and/or Proof-of-closed position switches. Companion flange sets available to simplify installation.